Saturday, April 6 was a great morning for the Chi Town Half Marathon and 10k. The weather was near perfect for running at 45 degrees at the start with calm winds and overcast skies. 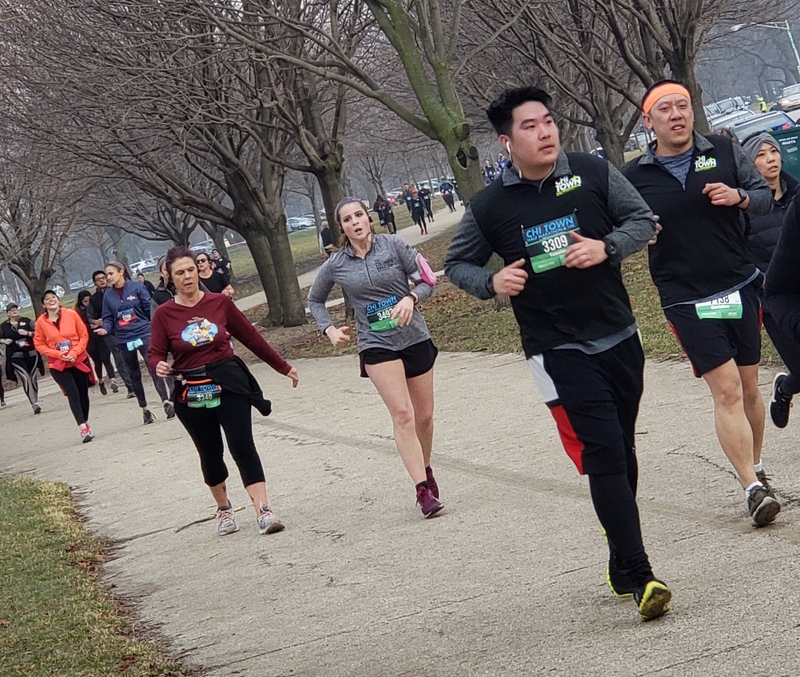 The race started early at 7 a.m. which helped runners avoid some of the congestion that usually occurs on the lakefront path on Saturday mornings. The half marathon and the 10k started at the same time, but the start corrals were separated in waves this year, which I think helped ease the congestion during the start of the race. The three waves were self-seeded, with the 7:00 – 9:00 minutes-mile runners starting first, followed by 9:00 – 11:00 minute-miles, and then the joggers and walkers. The course started at Montrose and headed north to the end of the newly separated lakefront trail. The runners then head south down the path, with the 10k-ers turning off around mile 4.5 to head back to the finish. The half marathon runners kept heading south and then through the park before turning around at mile 8.5 right before North Avenue and heading back on the path to the finish. I have run the Chi Town Half Marathon in previous years where there have been a few logistical concerns. However, this year the race went smoothly as far as I could tell; the course was very well-marked and fully supported with helpful and cheerful volunteers. I had to pick my packet up the morning of the race and the line was quick and efficient, as was the gear check. Gear check also provided plastic bags for runners to use to protect their bags and belongings from the damp ground, which I thought was a nice extra. The post-race party was great and the Portillo’s sausages and hot dogs seemed to be a hit. It was a little too early for me to enjoy the free sandwiches, but my husband was very pleased with the tasty post-race treat. There were also inflatable step and repeats for runners to take pictures with their newly earned medals which also seemed to be a lot of fun for everyone. 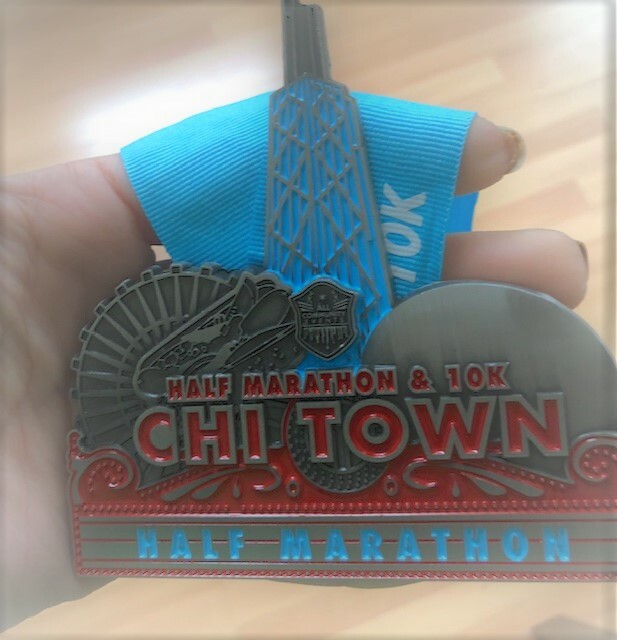 The ChiTown Half Marathon medal has always been one of my favorites and this year did not disappoint. In Chicago blue and red, the Navy Pier Ferris Wheel, the Hancock Tower, and Bean are represented well. All in all, the morning was perfect for a race. And the blazing fast times prove that! Jim Levesque was the first male to finish the 10k in 35:38 and Angie Epifano was the first female with a time of 38:41. Chris Hoffman was the first male to finish the Half Marathon in 1:12:20 and Dale Findlay was the first female in 1:23:43.